In what could be a sign of the week to come, the weather on Jan. 14 in Washington, D.C., mimicked the mood at Al Sharpton’s National Action Network “We Shall Not Be Moved” march. The protest kicked off the Martin Luther King Jr. Day weekend in the nation’s capital and was the first of a series of protests leading up to Friday’s inauguration of Donald J. Trump as the 45th president of the United States. Yvonne Murray and Elizabeth Scott — two of the hundreds in attendance — made the 230-mile trip from Brooklyn, New York, and their frustrations seemed to amplify the cold wind and freezing rain. 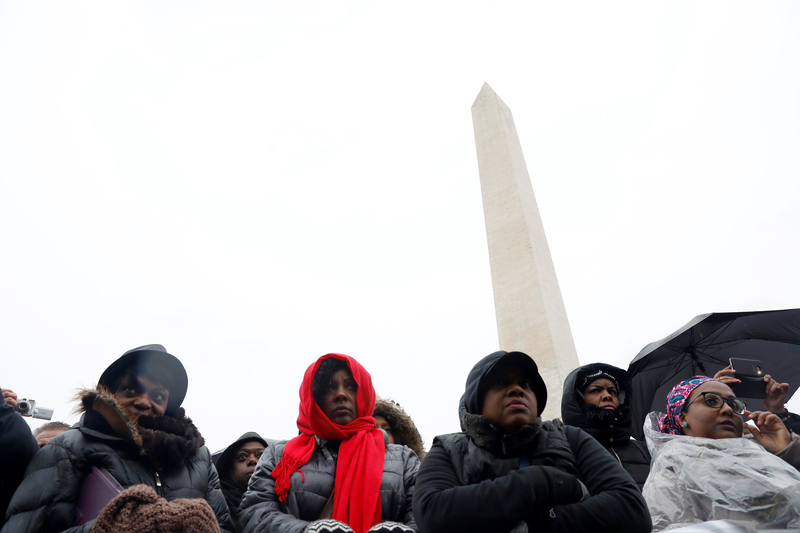 Beginning on the grounds of Washington Monument, the crowd made the half-mile trek along Independence Avenue to a park near the Martin Luther King Jr. Memorial. Protesters supported a potluck of causes: wage equality, women’s rights, criminal justice reform, health care and more. As precipitation fell in various forms, chants and hymns rang upward. At one point, shouts of “We want Obama back!” erupted. “We want Obamacare!” soon followed. Murray and Scott were two of more than 20 protesters from the Committee for Independent Community Action (CICA), a public housing advocacy organization, which opposes a controversial plan to involve the private sector in solving the financial difficulties of the New York City Housing Authority. Their beef stems from years of deplorable treatment and living conditions. Their passion comes from memories of families and friends forced out of their own neighborhoods — and sometimes into homelessness. The New York housing activists worried about what a Trump administration means for their fight against housing discrimination and for more public housing. For years, they and Trump have been less than cordial inhabitants of the same city. Marchers look on as Rev. 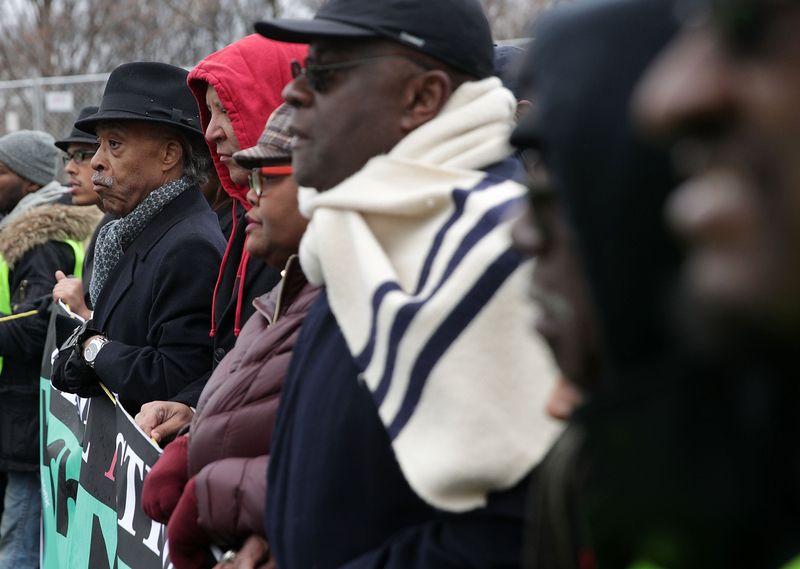 Al Sharpton speaks during the National Action Network’s “We Shall Not Be Moved” march in Washington, DC, U.S., January 14, 2017. But while Trump was the overall inspiration for Sharpton’s march, he was just one target on a much larger range. Murray and Scott, for instance, were largely focused on other politicians. Their red-and-white stop sign-picket signs read, “Stop NYCHA from pushing out the poor!” Bill de Blasio, New York’s Democratic mayor, has proposed a “NextGeneration” plan to reverse the housing authority’s budget deficits and its deteriorating housing stock. But residents say they understand the code words: “Revitalize” means “gentrify.” And gentrify means that while more money would be pumped into the local economy, they would be the ones be uprooted. On Jan. 14, those were rhetorical questions designed to unite the activists. The looming prospect of homelessness and the constant reality of poverty is a heavy burden to shoulder. They’ve seen broken promises and neglect spanning administrations and candidates from both political parties. But peace of mind exists in community. The CICA members marched through the nasty precipitation in D.C. for a seat at the table — a chance to make sure their lives are valued as much as those willing to move into their neighborhoods. Lenora B. Fulani is the director of Operation Conversation: Cops & Kids, a nonprofit operating in six cities that serves more than 10,000 young people in afterschool programs. She also holds the distinction of running for president in both 1988 and 1992, becoming the first black woman to land on the ballot in all 50 states. On Jan. 14, she was leading the housing activists’ march within the march. Born in the projects of Chester, Pennsylvania, Fulani spent the first nine years of her life in the same conditions she has since committed her life to battling. Being poor in the richest country in the world “breaks her heart,” she said. Her years in politics and community activism cemented her belief that while Republicans disagree with Democrats and Democrats disagree with Republicans, neither care much about the poor. “I don’t think we’re any less empowered by the election of Donald Trump than we would be by the election of Hillary Clinton,” Fulani said, citing former President Bill Clinton’s 1996 welfare reform and its negative impact on poor communities. Even if Trump disappeared tomorrow, she said, the level of poverty would not decrease. As the crowd walked into West Potomac Park, where the day’s speeches were about to begin, she spoke about how being poor involves far more than the lack of money. It’s bound up with poor education, the lack of community resources and violence that stems from the hopelessness these dilapidated environments foster. By now, protesters had rallied around the stage, with the Martin Luther King Jr. Memorial in the background facing the Potomac River. A stone’s throw away was the Franklin Delano Roosevelt Memorial. The sleet picked back up as Sharpton spoke. His demands for expanded voting rights, criminal justice reform, economic justice and the Affordable Care Act energized many, including Murray. She shouted in approval, even dancing in her turquoise poncho when stronger points were made. Scott, meanwhile, searched for a pen so she could obtain more signatures to send to de Blasio. Her eyes were wet, and not only from the precipitation. Back at home, she knows families trying to survive another winter in conditions that are, at best, deplorable. No one cares, she said, because their voices don’t matter to those in power.